|| Latest update: 08 May 2017. | for Wordpress. 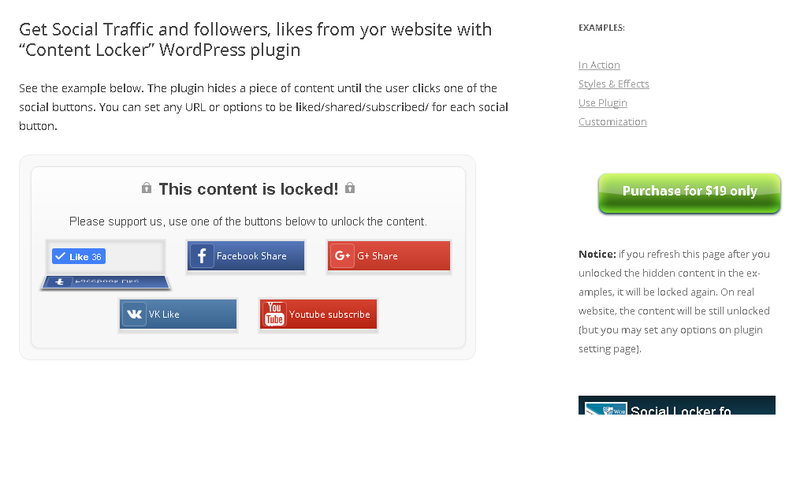 Social Locker – plugin for WordPress – New Edition! Do you continue use social buttons on your website, but visitors dont like/share your content? You should use this new original plugin! The Social Locker plugin is a set of social buttons that lock your content and ask your users to pay with a share/like/tweet/+1 your website to get access to hidden content, to get discount, to download or so. The plugin will help you to get more likes, tweets, google+, subscribers, customers and traffic! Provides 14 social buttons for all major social networks: Facebook Like, Facebook Share, Tweet, Twitter Follow, Google +1, Google Share, LinkedIn, YouTube, Pinterest etc. Use Live Preview button to see how it works! With the plugin, you can show any video on website from YouTube for a like or share to your website. Reward your visitors who share, like or follow your page by offering a promo code. Buyers get a discount, you get a new visitors from social networks. Ask visitors for a like or share for a Free Download link! Don’t lose potential revenue from new visitors. Write useful tips or some your secrets or publish an interesting story and lock it some partly via the plugin “Social Locker”. And see how article converts visitors to leads from social networks. You can choose any theme of social locker in the plugin settings (screenshots below). The plugin “Social Locker” provides you with advanced features to customize any aspect of your lockers. The Social Locker has a lot of usefull options!